El Cocay, which means “firefly” in the Mayan language offers guests more ways to indulge while enjoying the beauty of Mazatlán and El Cid Marina Beach Hotel’s casually elegant, Mediterranean-style accommodations. El Cid Resorts and El Cid Vacations Club, Mexico’s premier luxury resort & timeshare membership club are proud to announce its newest spa, El Cocay Amenity Spa & Gym, which is now open at El Cid Marina Beach Hotel in Mazatlán. 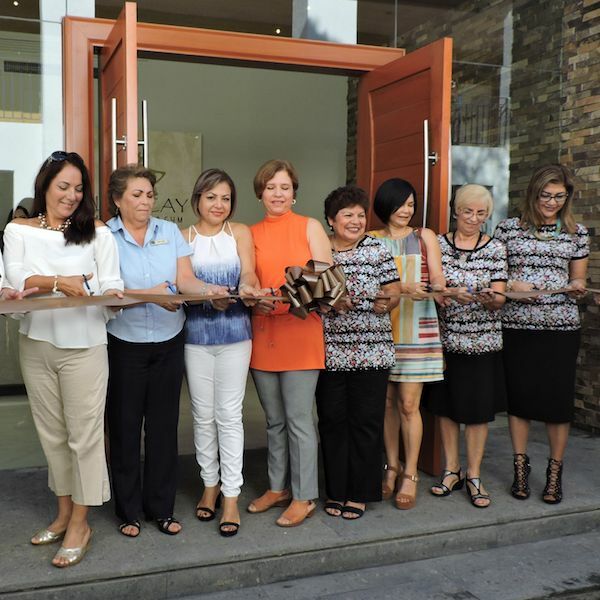 The ribbon-cutting ceremony to mark the spa’s opening was done by both distinguished members and guests of El Cid, and a group of women who have been dedicated employees of El Cid for over 20 years. El Cocay, which means “firefly” in the Mayan language offers guests more ways to indulge while enjoying the beauty of Mazatlán and El Cid Marina Beach Hotel’s casually elegant, Mediterranean-style accommodations. El Cocay’s staff of skilled masseuses and estheticians are able to provide guests with a plethora of services from massages to facial treatments. El Cocay’s menu of massages include deep tissue, sport, Thai, California, Reflexology, and hot stone treatments all at very affordable prices. Guests can spoil themselves with a wide range of facial treatments that are suited for all skin types. Some of the services El Cocay offers are pearl gold facials that help gradually return the skin’s natural color through the aid of radio frequency, and cutting-edge ice facial treatments that refreshes the face, fights acne, prevents wrinkles, promotes blood circulation, and reduces puffy eyes. El Cid Vacations Club wants its guests to feel rejuvenated, well-rested, and relaxed not only while staying at one of its fabulous resorts like El Cid Marina Beach Hotel in Mazatlán, but to continue to have that feeling once they return home. Surrounded by emerald colored waters and sandy beaches, El Cid Marina Beach Hotel in Mazatlán is an ideal resort for those who want to do it all, but get away from it all. Situated in the heart of the Golden Zone Marina, El Cid Marina Beach Hotel has the perfect location for guests who crave the excitement and nightlife of Mazatlán, but also appreciate taking time to unwind at the resort’s private beaches, and newest spa, El Cocay Amenity Spa & Gym. For close to five decades, El Cid has been one of the most prominent names for luxury resorts in Mexico. With beautiful properties in Riviera Maya, Cozumel, and Mazatlán, there is an El Cid Vacations Club resort for any traveler seeking an authentic Mexican vacation. Always evolving and expanding, El Cid Vacations Club remains on the forefront of providing its guests and members the best vacation experiences possible by maintaining the highest standards of hospitality.